Photos: Visit to JB, 2006. After the presentation of the proclaimation from the Los Angeles School Board on Sept. 1, 2006, Roger Ryan, AA6EO (son), Madeline Fokens, KB6IS (class of 1976) and Cliff Cheng, Ph.D., AC6C (class of 1975) toured JB. We spoke to two teachers who knew Ted from the 1970s, Mr. Sobel, Physical Education, and Mr. Geralt, Science. We were pleasantly surprised to see the 10-15-20M tribander and 2M Ringo Ranger still in the air. For a distance they appear to be in good shape considering they were put up in late-1970 by Ted and members of the San Fernando Valley Amateur Radio Club, W6SD. 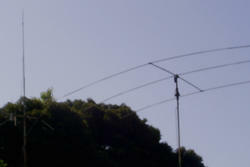 The antennas were donated by members of W6SD. The shop classes were closed as the teachers left JB. The electric shop bungalow is not a double classroom. Two classes are concurrently held there. The lathes and benches in the middle of the room were removed. The benchs which have cabinets beneath then along side the walls are still there. The radio room is still there but used differently. 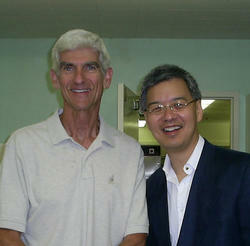 Mr. Sobel and Cliff Cheng, Ph.D., AC6C. Mr. Sobel remembers Ted as someone who really liked his students and they really liked him. Mr. Sobel was Cliff's PE teacher in the mid-1970s. He is still teaching some 30 years later. Mr. Geralt and Cliff Cheng, Ph.D., AC6C. Mr. Geralt arrived at JB in 1977 to teach Science. 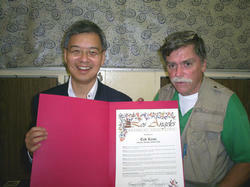 He remembers Ted for his innovativeness and sense of humor. The building still stands even though the use inside is not electric shop and ham radio. 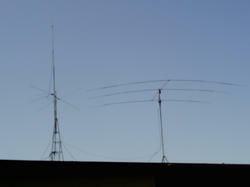 It is remarkable that 36 years later our club stations antenna are still up in the air. They have not been used since about 1983, 23 years or so. It is unlikely any maintenance has been done on them in this time. However, they appear from a distance to be in good shape. The antennas are a fitting monument to the fact that we were there and the good work we did.